Dominic A. Brandy, M.D. — Pittsburgh, Pennsylvania. Introduction: The QuickLift is a modification of the S-lift that varies from the S-lift primarily in the shape of the incision, the areas of undermining, the method of plication, and the vector of advancement. Two negative aspects of the purse-string plication technique used with the original QuickLift were an intraoperative bulging centrally that required trimming and minimal midface improvement. In 1 of the 85 patients reported in the original article, the aforementioned complication became noticeable as a slight bulge once swelling subsided. Materials and Methods: Instead of using 1 large oval–shaped purse string for plication, a firmly anchored small oval–shaped purse–string is encircled by a larger purse–string, with the latter purse-string modified to provide improved advancement of the midface. Results: The encircling double purse–string plication technique not only reduces the bulging effect of the deep tissues, but also provides stronger soft tissue support because of increased suture placement and anchoring sites. The cosmesis in the midface is improved over the former technique. Conclusions: A new variation of the originally described QuickLift plication technique reduces bulging of the deep tissues while simultaneously providing stronger superficial musculoaponeurotic system support to the neck, jowls, and midface. Blunt undermining or liposuction of the neck and/or jowl with a small submental tuck further enhances the result. The QuickLift 1 was introduced in 2004 as a modification of the S-lift.2 In that article,1 the author reviewed how the original facelifts performed in the early 1900s involved limited skin undermining and excision with no superficial musculoaponeurotic system (SMAS) manipulation.3-13 After the introduction of the SMAS as an anatomical entity in 1976 by Mitz and Peyronie,14 cosmetic surgeons began to perform facelift procedures with manipulation of the SMAS by either imbrication or plication15,16 and wide skin undermining. These additions to the original facelift of the 1900s resulted in much better and longer-lasting aesthetics, but with these came an increased incidence of nerve damage, necrosis, hematomas, and postoperative morbidity. In the 1990s, more complex deep plane, composite,17 and subperiosteal facelifts18,19 entered into the cosmetic surgeon's armamentarium. These procedures resulted in some further improvement, but at an increased risk of facial nerve injury, lower lid abnormalities, and 6–12 months of postoperative edema and morbidity. Because of this increased risk, in a world of escalating medical litigation, the need for an effective, but safer, procedure became apparent. In 1999, Zia Saylan2 introduced the S–lift as a solution to this increasing problem. This procedure was a much more conservative technique that delivered efficacious results for men and women between the ages of 40 and 60 while minimizing risk. Figure 1. (A) In the original S–lift, the excess skin was excised before undermining. The incision was the shape of an S and 1–2 cm of redundant skin was removed. (B) The S–lift undermining is performed approximately 5 cm anterior to the ear. Very little undermining is performed below and behind the earlobe. (C) In the S–lift, the permanent 2–0 braided nylon vertical U–shaped and oblique O–shaped purse–string sutures pass through the superficial musculoaponeurotic system and are firmly anchored to the deep tissues overlying the zygomatic arch. (D) Skin redraping is carried through at a 45o angle to the horizontal axis with minimal skin tension. The purse–string sutures support the advanced tissues, resulting in minimal tension on the flap and incision. Figure 2. (A) The initial incision for the QuickLift starts superiorly at the most anterior and superior aspect of the temporal peak, 3 mm behind the temporal hairline, and extends to the preauricular area, ending in the posterior crease of the earlobe with a 2 cm hockey–stick incision parallel to the Langer lines. This configuration allows for greater superior advancement of the flap with a better smoothing effect to the skin inferior and posterior to the earlobe. Usually 2–3 cm of skin is removed throughout the length of the incision. (B) The diagram shows the degree of subcutaneous undermining on the average QuickLift patient. Notice the increased undermining inferior and posterior to the earlobe when compared to the S–lift. Also note the increased undermining in the temporal region, which will slightly affect the periorbital area. (C) Instead of performing a U–shaped and an O-shaped purse-string suture, the author utilizes 1 very large O–shaped suture. This large purse–string creates an intraoperative bulging effect centrally that requires trimming. (D) The vector of skin advancement with the QuickLift procedure is usually from 60o to 75o to the horizontal axis. The choice of vector depends on the desired aesthetic result. This increased angle helps significantly improve neck skin redundancy. 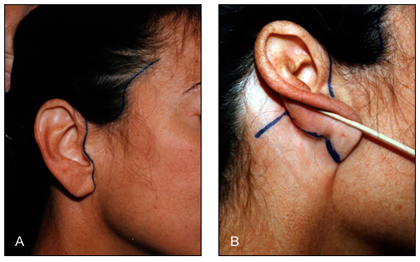 The S–lift was originally described as an S–shaped initial incision at the preauricular and temporal areas, followed by a pre–excision of 1—2 cm of skin (Figure 1A). An oval–shaped undermining was then performed approximately 5 cm anterior to the ear (Figure 1B), after which a permanent 2-0 braided nylon vertical U-shaped and an oblique O-shaped purse–string suture were inserted into the sagging SMAS layer (Figure 1C). The significant key to this purse–string technique was that the SMAS plication could be performed in a small space and was firmly anchored to the deep tissues overlying the zygoma. This fixation point contains no significant nerves or blood vessels, which allows for very safe and extremely strong tightening of the SMAS. After the purse–string plication was performed, the skin was redraped at approximately a 45o angle (Figure 1D). It can be performed under local anesthesia alone. No hospitalization or bandage is required. Most patients can comfortably return to work in 3—7 days, depending upon the degrees of ecchymoses and pain. The operation can be completed in 1—2 hours. The results are good and long-lasting. The main disadvantage is that it is limited to patients with early facial aging (between the ages of 40 and 60 years). Figure 3. (A) A 45o bevel is made on both the temporal scalp and temporal skin in the area of the temporal incision. (B) The temporal scalp and temporal skin edges are carefully approximated with loupe magnification at the time of surgery. The buried hair roots will typically go into anagen effluvium for 3 months. (C) At 3 months, when hair follicles exit anagen effluvium, hair starts growing through and in front of the scar. There is no pre-excision of skin at the preauricular area, but the skin removal is customized at the end of each case. Normally, 2-3 cm of skin is removed throughout the length of the incision (Figure 2A). The superior aspect of the incision extends up to the most anterior aspect of the temporal peak, but does not move the temporal hairline (Figure 2B). It is important, however, that a 45o bevel be used where the temporal scalp meets the temporal skin so that hair will grow through and anterior to the scar 3 months later (Figure 3A—C). The temporal aspect of the incision (Figure 4A) allows for better handling of dog–ear formation at the temporal region while additionally creating some smoothing at the lateral midface, and periorbital region. A 2–cm hockey-stick incision (Figures 2B and 4B), that follows Langer's lines (Figure 5), at the posterior earlobe crease and 5 cm of increased inferior–posterior undermining (Figure 2B) with a Burrow's Triangle formation (Figure 2A) prevents posterior dog–ear formation and a greater smoothing affect of the neck region. There is only 1 large oval-shaped purse–string instead of 2 smaller purse-strings (Figure 2C). The advancement vector is directed much more superiorly (60o to 75o), which allows greater improvement of the neck and jowls (Figure 2D). The procedure works well on patients of all ages because of greater ability to deal with the excessive redundancy of skin at the neck and jowl regions. This improvement is primarily because of the revised incision shape that allows for greater superior direction of tissue advancement. The complications described for the QuickLift were minimal and consisted of 1 case of necrosis (lcm2) at the superior preauricular region (1.1%). A minor aesthetic complication occurring in 1 patient (1.1%) was the bulging of the tissues central to the large purse–string suture. This intraoperative bulging, noted in 50% of cases, was addressed by trimming the excess subcutaneous and SMAS tissue within the purse–string until the elevation was no longer present externally. In only 1 of 85 patients was the complication noticeable postoperatively, presenting as a bulge in the region central to the plication suture several months after surgery once the edema subsided. This was flattened with 2 sessions of 10 mg/mL triamcinalon injections (10 mg/dose) spaced 2 months apart. Figure 4. (A) Preoperative markings on the anterior aspect of a QuickLift patient. (B) Preoperative markings on the posterior aspect of a QuickLift patient. The 2–cm hockey stick is made into the Langer lines so that healing is optimized. The posterior incision is 3 cm long and is made slightly above the postauricular crease. Another aesthetic concern was that the neck and jowls were dramatically improved, but the midface was only minimally affected. In an attempt to reduce the sequela and improve the midface, the author developed an encircling double purse–string support for the sagging SMAS and platysma. It was the observation of the author that patients who had neck and/or jowl liposuction or undermining of the neck and/or jowl with a 3–mm Coleman cannula had better, longer–lasting effects. The purse–string technique described in the original QuickLift began with a 2–0 braided nylon suture placed deep into the tissue directly over the zygomatic arch approximately 1.2 cm medial to the top of the tragus. This area over the zygomatic arch is devoid of any important neurovascular structures, which allows the surgeon to grasp a large amount of tissue for a strong fixation point. Once this initial anchoring point is created, three 1.5–cm–long bites are taken in a directly inferior direction; once these are completed, several 1.5– cm bites are placed in the SMAS and platysma following directly behind the extent of the undermining (Figure 2C). The suture is drawn as tightly as possible and 5 throws are made to create a very firm knot. A 2–mm tag is left on the knot so that unraveling is prevented. In contrast, with the encircling double purse-string plication technique, the initial anchoring suture is placed approximately 3 mm medial to the original anchoring bite (1.5 cm medial to the superior aspect of the tragus). This initial suture is placed deep into the tissues overlying the zygomatic arch (Figure 6A, green marking). Two 1.5 cm long bites of SMAS only are made inferomedially in the direction of the inferior aspect of the jowls (Figure 6A). One 1.5 cm bite of SMAS is taken perpendicular to the first 2 grasps, and then 4 or 5 grasps are taken back up toward the original suture (Figure 6A). This purse-string is then drawn tightly, 5 throws are placed to create a firm knot, and a 2–mm suture end is left behind. Because this purse-string is smaller than the originally described purse–string, there is minimal to no bulging. Figure 5. The 2–cm posterior hockey–stick incision is made in the Langer lines so that healing is optimized. This diagram demonstrates Langer lines in the postauricular region. The second purse-string is placed similar to the initial anchoring suture described in the original QuickLift technique. It is placed 3 mm lateral and 3 mm superior to the initial anchoring suture (1.2 cm medial to the top of the tragus) and is as deep as the original suture (Figure 6B, red marking). The following sutures are nearly identical to the originally described purse–string suture (Figure 6B) except that the final bites are placed more superiorly to better elevate the midface (Figure 6C, purple marking). The final suture is also anchored 3 mm into the deep SMAS overlying the zygomatic arch so that the midface has firm support in a V configuration (Figure 6C, orange marking). The author retrospectively reviewed 203 consecutive patients who underwent this revised plication technique over a 1–year period as per Figure 6. All patients had the exact same extent of sharp undermining. The use of blunt neck and jowl undermining or liposuction with a 3–mm Coleman cannula varied in accordance with the cosmetic problems at the time of surgery. A 4 cm X 5 mm submental tuck was utilized on patients that had liposuction or had extensive skin laxity (Figure 7). The encircling double purse-string plication technique reduced the intraoperative bulging sequela found with the original QuickLift purse–string technique. This revised method was used on 203 consecutive patients. In the group of 203 patients, no bulging elevations were seen after resolution of postoperative edema. This technique also appeared to create a much stronger support for the SMAS and platysma than the former technique, as evidenced by better results in the neck, jowl, midface, and periorbital regions (Figures 8 and 9). It was the observation of the author that all patients received significant improvement—very similar to, and sometimes better than, what the author achieved with more extensive facelifts. Those who had strong jaw lines and minimal facial and neck adipose tissue had the most dramatic improvements. All patients in the review had the exact same amount of sharp undermining as demonstrated in Figure 2B and all had either blunt undermining or mild liposuction with a 3–mm Coleman cannula of the neck and/or jowls. In patients with extensive skin laxity or those who had liposuction, a 4 cm X 5 mm submental tuck was usually performed (Figure 7). It was the observation of the author that results at 1 year were improved when compared to the QuickLift alone. However, it was noted that the necrosis rate (>1 cm2) at the superior preauricular area increased from 1.1% (QuickLift procedure only) to 3.5% (n = 7 of 203 patients) with the addition of blunt undermining or liposuction. There was also slightly more bruising, as would be expected. The QuickLift is a procedure that offers the advantages of local anesthesia, no hospitalization, no bandage, minimal complication, and little loss of work time. This procedure has been found to work well in the neck and jowl regions, and because it brings the second purse–string a little more superiorly, the midface is elevated to a greater degree as well. If the eyelids and brows require rejuvenation, other forms of surgery will be necessary. The author does not address the midface, eyes, and brows with subperiosteal, composite, or deep plane lifting because of the prolonged morbidity and increased risk of permanent motor nerve damage and lower eyelid deformities. 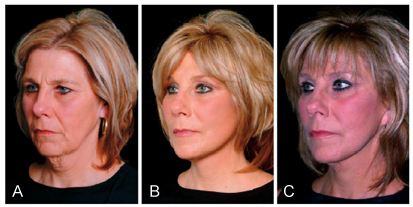 If more improvement is needed in the midface, the author utilizes submalar cheek implants,21 fat transfers,22 or an extension of the undermining with tissue recruitment into the cheek area.23 For the eyelid region, the author prefers lowerlid blepharoplasty, chemical peels, and fat and soft tissue fillers, which may soften aging without significant risk. For eyebrow elevation, the QuickLift incision is extended into a lateral forehead rhytid, resulting in an effective lateral subcutaneous browlift. Figure 6. (A) The first small purse–string suture is started 1.5 cm anterior to the tragus over the zygoma. The first anchoring suture is noted in red. Two 1.5–cm–long bites of SMAS are made toward the inferior jowl, one 1.5–cm–long bite is made perpendicular to these, and 4 to 5 1.5–cm–long bites are made toward the first anchor suture. (B) The second anchoring suture is 1.2 cm from the tragus and 3 mm superior and 3 mm medial to the first anchoring suture and is noted in green. Initially, this purse–string is the same as the original purse–string, grabbing significant platysma, then following right behind the area of skin undermining. (C) The larger second purse–string differs from the original purse–string in that it is extended more superiorly noted by purple. This purple section helps elevate the midface. This purse–string also has another anchoring point noted in orange. These 2 anchoring sutures create a V configuration of strong support. With regard to the longevity of the QuickLift, it appears that in the immediate 3 months there is a very slight return of sagging secondary to the viscoelastic properties of skin and SMAS. However, the encircling double plication technique appears to create a consistently better cosmesis at 3 months when compared to the original technique. This may partly be because of the fact that if 1 of the purse strings should tear through, there is a backup for continued SMAS and platysmal support. If the surgical area is examined under the skin at 3 months from the time of the surgery, the 2–0 braided nylon suture will have no tension on it; however, the tissues will remain in an uplifted position. 24 Scarring and fibrosis has therefore taken over for the encircling double purse–string plication at that time. Figure 7. If extensive skin laxity is present or liposuction has been performed, a 4 cm 35 mm submental tuck is added to the blunt undemrining with a 3 mm Coleman cannula. The fusiform excision should not exceed 5 mm in width so that dog–ear formation is avoided. Area with x's indicates undermining to the angle of the hyoid. Neck and jowl liposuction, or blunt dissection of the region with a 3 mm Coleman cannula, performed inconjunction with the QuickLift results in more stability to the neck/jowls at 3 months. The results do not appear to change from 3 months to 1 year. This is probably because the skin of the neck and/or jowl has the ability to glide slightly over the undersurface at the time of superior advancement of the skin. This new skin position then adheres to the undersurface through the scarring process. The blunt dissection with a 3 mm Coleman cannula adds approximately 5 minutes to the procedure and results in very little to no bruising if Reston foam is applied postoperatively. If extensive skin laxity is present, a 4 cm X 5 mm submental tuck is utilized. Figure 8. (A) A 54–year–old patient before the QuickLift. Oblique view. (B) Same patient 3 months after the procedure. Note the improvement of jowls, neck, midface, and periorbital region. Patient had no other procedures. (C) Same patient 12 months after surgery. There appears to be little change from 3 months. If the patient has very prominent jowling or an excessively bulky neck, jowl and neck liposuction is almost always performed with the 3–mm Coleman cannula. This procedure adds approximately 10 minutes to the procedure and does leave some ecchymoses in most patients. Reston foam application, however, does keep this bruising to a minimum. A 4 cm X 5 mm submental tuck is used on almost all patients that have had liposuction. Figure 9. (A) A 55–year–old patient before the QuickLift. Oblique view. (B) Same patient 3 months after the procedure. Note the improvement of jowls, neck, midface, and periorbital region. Patient also had Botox to the glabella and under the lateral brow. (C) Same patient 15 months after surgery. There appears to be little change from 3 months. Reduction of deep tissue bulging that was present with the single purse–string plication technique. A much stronger plication effect because of the additive effects of the small and larger purse-string sutures. Improved results in the neck, jowl, midface, and periorbital area, and more stability at 1 year. The presence of a backup purse-string to support the sagging SMAS in the event that 1 of the purse–strings tears through. The primary disadvantage is that when blunt undermining or liposuction is added to the QuickLift, the incidence of necrosis increases (from 1.1% to 3.5%) and bruising is more probable. This increased necrosis rate is most likely because of more embarrassment of the skin vascularity. If a patient fears this increased necrosis risk, the QuickLift procedure should be performed alone. The double purse–string has no disadvantages other than the patient's feeling a little more discomfort the first night after surgery. The article describes an encircling double purse–string technique that eliminates the bulging complication seen with the original QuickLift technique and creates a stronger plication and improved aesthetic results in the neck, jowls, midface, and periorbital region. Concomitant liposuction or blunt undermining of the neck/jowls with a 3–mm Coleman cannula and a submental tuck also appears to enhance the long–term results. Brandy DA. The QuickLift_: a modification of the S-lift. Cosmet Dermatol. 2004;17:351-360. Saylan Z. The S-lift for facial rejuvenation. Int J Cosmet Surg. 1999;7:18-22. Lexer E. Zur gesichtsplastik. Arch Klin Chir. 1910;92:749. Joseph J. Plastic operation on protruding cheek. Dtsch Med Wochenschr. 1921;47:287. Joseph J. Nasenplastik and sonstige gesichtsplastik negsteinen anhang tiber mammaplastik. Leipzig Curt Kabitzsch. 1928:525-527. Joseph J. Verbesserung meiner hangemangenplastic (melomioplasik). Dtsch Med Wochenschr. 1928; 54:567. Passot R. La cheirurgie esthetique des rides du visage. Presse Med. 1919;27:258. Passot R. La chirurgie esthetique pure (technique et resultants). Paris Gaston Doin Cie. 1931:176-180. Morestin H. La reduction graduelle des deformities tegumentaries. Bull Mem Soc Chir Paris. 1915; 41:1233. Bourguet J. La chirurgie esthetique de la face. Concours Med. 1921:1657-1670. Lagarde M. Mouvelles techniques pour let traitement des rides de la face et du cou. Arch Franco-Belg Chir. 1928;31:1954. Noel A. La Chirurgie Esthetique Son Role Social. Paris: Mason Cie; 1926:62-66. Noel A. La Chirurgie Esthetique. Clearmont (Oise): Thiron et Cie; 1928. Mitz V, Peyronie M. The superficial musculoaponeurotic system (SMAS) in the parotid and cheek area. Plast Reconstr Surg. 1976;58:80-88. Adamson JC, Horton CE, Crawford HH. The surgical correction of the ''turkey gobbler'' deformity. Plast Reconstr Surg. 1964;34:598. Rees TD, Aston S. Clinical evaluation of submusculoaponeurotic dissection and fixation in facelift surgery. Plast Reconstr Surg. 1977;60:851-859. Hamra ST. Composite Rhytidectomy. St. Louis, Mo: Quality Publishing; 1993. Ramirez OM, Pozner JN. Subperiosteal minimally invasive laser endoscopic rhytidectomy: the SMILE facelift. Aesthetic Plast Surg. 1996;20:463- 470. Tessier P. Subperiosteal facelift [in French]. Ann Chir Plast Esthet. 1989;34:193-197. Fulton JE, Saylan Z, Helton P, et al. The S-lift facelift featuring the U-suture and O-suture combined with skin resurfacing. Dermatol Surg. 2001;27:18-22. Binder WJ. Submalar augmentation. Arch Otolaryngol Head Neck Surg. 1989;115:797-801. Satter G, Sommer B. Liporecycling: immediate and delayed. Am J Cosmet Surg. 1997;14:311-116. Brandy DA. A method of augmenting the cheek area through SMAS, SubSMAS and subcutaneous tissue recruitment during facelift surgery. Dermatol Surg. 2003;29:265-271. Saylan Z. Minimal Advances in Facial Cosmetic Surgery. American Academy of Cosmetic Surgery, Washington. DC, April 16-17, 2004. Lecture.